Red Dawn is one of my all-time favorite movies. Since almost every remake is a disaster, I don’t know what to expect from this…. 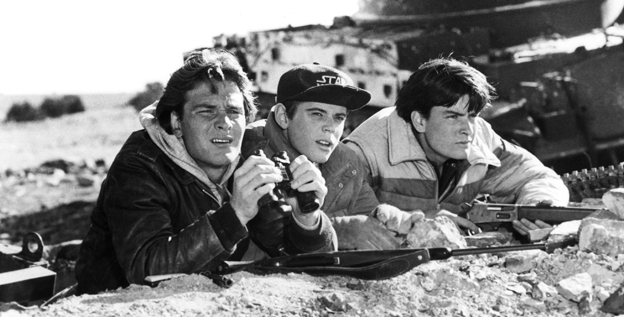 Patrick Swayze, left, C. Thomas Howell and Charlie Sheen starred in the original ‘Red Dawn,’ released in 1984, as a group of teenagers who defend their town from invading Soviet soliders. Sometimes you don’t need a big army to resist an enemy occupation — especially when you are dealing with Chris Hemsworth (Thor of The Avengers), Josh Hutcherson (Peeta Mellark of The Hunger Games) and Josh Peck. The original Cold War film featured a troupe of then up-and-coming stars — including Charlie Sheen, Jennifer Grey and her future Dirty Dancing co-star, Patrick Swayze — defending their Midwestern town from the Soviets. The remake has moved the location to a Washington state high school under seige, but the same eye for emerging talent remains. When the film was shot in 2009, Hutcherson had not yet been cast in The Hunger Games, and the closely cropped Hemsworth was just training for Thor. 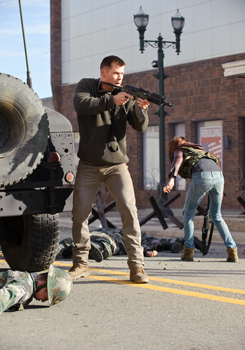 Red Dawn‘s release was delayed because of financial problems at MGM, the film’s distributor. The Red Dawn enemy assailant has changed as well during the delay: Filmmakers re-edited and digitally altered the finished film. In the end, the attacking forces became the North Koreans (aided by the Chinese and Russians). Meanwhile, the members of the small-town high school “put aside our John-Hughes-Breakfast-Club difference and unite” to fight off the attack, Peck says. The youngsters form a resistance group called The Wolverines, which includes Adrianne Palicki, Isabel Lucas and Connor Cruise. They show off their chops in an ambush scene that recalls the original movie. Hutcherson plays Cruise’s best friend in the film and was impressed with his “gung-ho” co-star. “He definitely takes after his dad (Tom Cruise) in the action department, 100%,” Hutcherson says. Though he enjoys his on-screen bromance with Cruise, Hutcherson doesn’t get a romance in the film. It’s not a bad thing as he gears up for The Hunger Games: Catching Fire.